I’ve decided I might stick short chess-related snippets here, in order for them not to clutter up the blog pages. (Assuming I ever get around to adding any new posts…. ). HOWEVER… there is a rather obvious snag with this brilliancy. Can you spot it? I actually picked up the R on b1 and was half-way to b7 when I realised what was wrong. Luckily my opponent is a gent and we don’t play touch-move in casual games. So I got to have a re-think. However, there are actually at least two quick forced wins for White in this position. For one of them the first move (which I spotted and played after I’d ‘undone’ 1. Rb7:) is fairly easy, the continuation a bit less so, but quite pretty. Suggestions? BTW, if you are a non-chesser who has strayed here, and is mystified by this idea of timing chess games or ’10 minutes for your moves’, Dominic Lawson (yes, that Dominic Lawson) explains in an article here. Ten-minutes-a-side for all your moves is a common way to play casual club chess, suitable even for us older gents. When I was a teenage chess fiend, I used to play endless 5 minutes-a-side games (5 minutes to make ALL your moves, sometimes known as ‘Blitz’), notably in my school lunch hours. However, I now find that 5 min is just TOO fast – ageing synapses, I guess. It is White to play. The game actually finished: 1. Nd5: Nd5: 2. Nh6+? Kh8?? 3. Nf7:+ Black resigns. What had both players missed? Playable chess board…. well flash! Our resourceful blog overlord RPG tells me we now have a “Chess Flash” plugin installed, hopefully enabling you to actually play through games that I post up here on a virtual board! As a test, here is one of my ‘time handicap’ rapid games from a club tournament last month. Since I had a whopping 16 minutes thinking time to my opponent’s (distinctly meagre) 4 minutes, you could call it a bit of an uneven contest, though he is rated rather higher than me, and is an excellent rapid player. Anyway, let’s see if the plugin works! I am playing Black. I played a (Summer) League game on Monday night, so by club night on Tuesday I was a bit “chessed out”. We spent most of the evening analysing games people had played the previous week or at a local chess congress at the weekend, rather than actually bashing out the rapid games. So I’m slightly stumped for a interesting ‘what happened next?’ problem for this week. But here’s an easy-ish one, from a 10 min-a-side game a month or two back. One of the things I’ve noticed since starting to play chess again, and which I think is directly attributable to the ubiquity of computer chess and playing online, is that tactical awareness has gone up a lot. People play much more for tactical combinations, and far less for strategic objectives. This is quite noticeable in normal time-limit games (where you have, say, 65-95 minutes to make all your moves), so it is all the more noticeable in rapid games (10 minutes or less for all your moves), which are always more tactics-based. Trying to grind out a logical strategic victory in a 100-move marathon is a high-risk strategy in speed chess, as there is a good chance you lose on time whilst trying to make your extra pawn count in the endgame. Now, I had to try and remember this particular game afterwards (You don’t usually record moves when you only have 10 min to think of them all in! ), so I am not 100% sure whether the Black pawn was on b4 or b5… though it’s not a critical point. So the easy question: how did the game now finish? And a slightly more taxing one; could Black have played better moves than 1. ..h6 and 2. …Kh7? For something a bit more refined, I can’t resist sticking up this one, which we were kicking about on the Club Facebook page last week. I should say that it wasn’t me that posted this there, but one of my club sparring partners, local historian and author Graham Phythian. He tells me that it is a 1985 problem study by one H. Valkevitz. Now, normally I don’t care much for composed chess studies, as they often show positions it would be utterly impossible to get in a real game, which I find rather dims my interest in them. This one, however, would be at least be feasible as a ‘real’ endgame position. 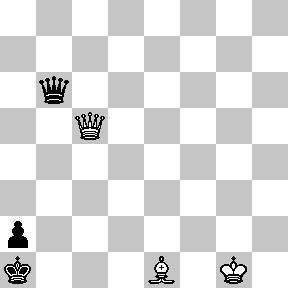 White has Queen and Bishop vs Queen and Pawn, but the Pawn is only one square from becoming a Queen. As Graham says, White’s first move is fairly easy to spot, but there are many ways for White to draw, and only one way to win. Two games in the Summer League now gone, with one win and one loss. The loss (last week) was a bit frustrating – partly because I’d previously lost to the same 154/1900-ish graded opponent in the Winter League, so I was hoping for revenge, and partly because I got a better and perhaps even winning position and then blew it in time trouble. I might put the game up with some annotations when I have time. Meanwhile, here is another rapid-play puzzler, from a 10 min game (well, 10 min for me and 15 for my opponent) played after my League loss last Tuesday. This one comes from a Sicilian Dragon Yugoslav Attack. Now, in this position Black (me) has earlier sacrificed the exchange (R for N) but without getting much compensation, though the White King’s position is a little bit draughty. Anyway, White is trying to consolidate and convert his material advantage. First question, what moves should White consider to consolidate and why? In the game White actually played 1. Ra7, and I replied 1. …Nxe4?! So the next question: what do you think happened next? And was 1. …Nxe4 Black’s best shot? White has just responded to the threat on f2 by playing his Knight from h2 to f3. First question: what SHOULD White have played? Second question: what does Black play now? And what happened? Diagram 7 – from a few moves later – Black to play. How does Black finish White off neatly? There is now a neat finish leading to checkmate or win of even more material. Can you spot it? Seems to me from a quick glance that you must have missed the black Q x b1 as the defense against your rook sacrifice after having played Re1 to b1. On the other hand, by my limited calculations, and I may be missing something as the phone keeps ringing, it seems that the correct sequence for winning would be Ba6. If b x B on a6, then the white Q comes to c7, threatening mate with the Q on b7. Even if black R comes to b8, then white Q take b8#. If black doesn’t take the sac by b x a6, then B x b7#. Hi Steve. Yes, you’re right that what I missed was that the Black Q was covering b1!! Actually, it’s possibly a bit more interesting than just ‘oh *! **!’, because for most of the game I’d had doubled c-pawns, with pawns on c2, c3 and d4. Of course, if there was still a pawn on c2 in the position, then Rb7: and Rb1+ would be a nice simple mating finish, as the b1 square would not be under attack by the Black Q. I think maybe part of my ‘chess brain’ still ‘residually’ thought the pawn was on c2, so that the b1 square was ‘safe’. Plus, of course, you ALWAYS want to sac a Rook on b7 when the b-file is open and Black King has hidden on the Q-side! See e.g. the old game I gave in this post. On the 1. Ba6 idea, agreed that 1.. ba: 2. Qc7 is terminal. So it has to be 1… Rb8 or 1. ..b6. After 1. ..Rb8 I’m not sure that 2. Qb8:+ Kb8: 3. Rb7:+ actually wins by force after either 3. ..Ka8 or ..Kc8 – mainly because the Black Q is covering e8, so you can’t play 4. Re8 mate. And after 1. Ba6 Rb8 2. Qc7 Black can play ..b6, when again I can’t see an instant mate. Anyway, it turns out to be a surprisingly interesting litte position. The second one is a lot more straightforward, and far more embarrassing for both players!! Austin, I see your point. But–as far as I can see, after Ba6, Rb8 loses for black, because of B x b7 which forces …R x b7, followed by Qe8+, …Q x Q and R xQ forcing mate. On the other hand, for black this CAN be prevented by b6 which won’t give white the open file to force the mate. I now see (I think) that for white Q c7 is the correct sequence and wins. Re8 is the only defense, black won’t have time to play Rf7 because he has to play Rb8, which can then be followed by Ba6 and I think black will be in trouble. As for the 2nd game, perhaps I’m missing something, but I don’t see why black can’t simply take the knight with g7 x N. True, white will have some pressure, but losing a knight for a pawn and then another knight, I think black can withstand the attack by defending with Bg7. 1. Good spot on 1. Ba6 Rb8? 2. Bb7:+! forcing mate after 2. …Rb7: 3. Qe8+. Another one that I’d missed. But as you say, 1. Ba6 b6! is a tougher nut to crack: if 2. Qc7, then…Rb8 seems to defend. 2. Once one ‘rejects’ 1. Rb7: (and possibly 1. Ba6) then 1. Qc7 is the obvious move, I think. 1. ..Rb8 is forced (as you say). In fact this is what we played in the game, but Black lost on time before I could play my next move. I’d been looking at 2. Ba6, but if 2. Ba6 b6! we get back to the same position as after 1. Ba6 b6 2. Qc7 Rb8, where it’s not obvious how White can break through and the counter-threat of …Nf4 looks troublesome. There is, though, a different and rather pretty clear winning move for White after 1. Qc7 Rb8, which I only spotted when analysing after the game. 3. In the second game, Black didn’t take the Knight on h6 because he (and White, which was me) both assumed that after (1. Nd5 Nd5: 2. Nh6+) …gh: the game would finish 3. Qg4 (or g3) check, forcing 3… Bg7 and then 4. Qg7: mate. But we’d both missed a rather important and embarrassing detail. Thanks for not giving it away! I have been musing about the solution en route to a Gordon conference today, on and off between and on flights. Without the benefit of having a chessboard and being able to check it out, I am pretty certain that after Qc7 …Rb8, white wins by the sac at R x b7. This forces R x R, otherwise white has R x b1#. Following this, white has a series of variations, and I haven’t worked them out in their entirety, but I am pretty sure that Qc8+ followed by …Rc8 and then Q x c6+ …Rb7, Qc8+ …Rb8 and now the bishop can enter the fray with Bd5+ and it’s downhill thereon for black. Still haven’t looked carefully at the second one, but will get to it probably next weekend! Ha! Good thing I don’t smoke cigars! Truthfully, I don’t see it, but can’t help thinking that it’s still R x b7 followed by Qc8+ and then something with that bishop. When I get back home I’d like to try on an actual chessboard. I know that’s “cheating” for you higher ranks, but after several moves in my head I’m not “seeing” the new board as it should be. Guess that’s why I didn’t get past the 1400 rank! I’ve never really been able to ‘see’ the (a few moves ahead) board in my head the way one assumes people who play blindfold chess can do, which probably explains why I ‘max-ed out’ as a player at 2000-2100. Don’t know whether it is something one can learn, at least up to a point, but some players do seem to have an innate ability to do it. Being about to play multiple simultaneous games ‘blindfold’ always struck me as the single most startling thing that many chess masters can do. Blindfold chess has actually been the subject of an entire scholarly history written by Eliot Hearst, a Psychology Prof (now retired) who is/was also a chess master in his young days. I’d quite like to read the whole book (as opposed to Google snippets), but the whopping price tag is a bit of a disincentive. Going back to the problem, try looking at it this way. After 1 Qc7 Rb8, we know that if the White Rook could reach e8 without being taken then we could checkmate Black at once with 2. Qb7:+! Rb7: 3. Re8+ and mate on b8… except it doesn’t work, because the Black Q is guarding e8 from her post on g6. So is there any crafty way we can decoy the Black Queen away from the defence of e8? BTW, most of my best ideas come from analysing with a board and pieces after the game, trying to see all the good moves I’d missed! I think this is the chess version of the famous Esprit d’escalier. Actually that’s the first thing I looked for! I wanted to bring B to d3 to get the black Q off the e8 square but I got stuck with the Q moving to f2 forcing an exchange of queens. That has to be the answer, burnt visualization skills are lacking without a board to see how that plays out! Correct. 1. Qc7 Rb8 (forced) 2. Bd3! and then if 2. ..Qf7 3. Re7 should decide – e.g. if 3. … Qf8 to cover e8, then 4, Rb7: and mate next move, or if 3. …Qa2: then e8 is unguarded so 4. Qb7:+! forces mate. 3. Re7 is one of those moves that you would spot instantly if shown the position after 1. Qc7 Rb8 2. Bd3 Qf7, but which is much harder to spot ‘envisaging’ the position in one’s head two moves ahead, at least for us ordinary Patzers. After 2. Bd3! I think Black’s best try is 2. …Rf7, but 3. Bg6: Rc7: 4. Bh5: just leaves White a Bishop up. Or explained why the second game is so embarrassing for both Black AND White! BTW, I’m hoping RPG might set me up a chess plugin which would give ‘playable boards/games’, which would make the chess stuff a little more accessible. Just had a quick peek at your blitz game; I like white’s development until cxd5, which seems bad for white, and then the Q side castle, which had no real point when black had already castled and had the R protecting your Q on the back rank. The castle got white into a series of weak/questionable moves that allowed you to move in for the kill. Nice! Thanks Steve. If I play those Saemisch-type positions with White I like to close the centre with d5 before I castle Queenside and start a standard Kingside attack w h4, g4 etc. If White allows exd4, the position takes on more of a Sicilian Maroczy Bind character, when the White K definitely belongs on the Kingside. The Dragon Variation where Black plays the analogous …d5 move has White castled Queenside, as here, but with the critical difference that White’s c-pawn is on c2, not c4. This makes the White K quite a lot more secure. Accepting the sacrifice on d5 when both c-pawns have already gone must be a bad idea – Black gets far too many open lines for his Rooks, Queen and Bishops, and White has too few defenders. Happily for me, I was finally able to take advantage of some weak moves by the opposition and a distinct positional advantage to leverage it into a winning situation (rather than squander it, as is my tendency. This position then wins any number of ways, for example Bb4 and pushing the white Q off the 7th rank and protection of Qxf2#, or slower wheedling down of white’s pieces. Nice thematic stuff. I used to play the 3. e5 advance line against the Caro as White back in the day, with mixed success. Don’t like your opponent’s 4. h3 – if the P goes to h4 later (see his 7th move) it takes two moves when it could have taken one, so wastes a move for nothing. Here’s one old one in the line with me playing White, in the 1975-6 London U-16 Championship (sic). We were both graded in the mid-130s ECF, so c 1700 FIDE if you believe the conversions. It was the 11th and last round, on the 6th day of the tournament, so I dare say we were both a bit battle-fatigued. Or even desperate to go home. Great to have these playable games. I play a fair bit of on-line chess but rarely encounter the Caro Kann. When I do, I usually try the caveman attack, which is a lot of fun and perhaps not so well known, so can catch out the unwary. There’s an article on the Caveman Attack here, which mentions the Rook sacrifice (letting the Black Q take on b2 and then on a1) which I’m sure I remember Steve M alluding to at some point. Nowadays I’m so boring as a player that I’d probably play the Exchange Variation against the Caro. I really like the Caro Kann, (despite never remembering if it’s C.K. or K.C.) because it severely limits the scope of white’s options. All the Sicilians are of course gone, and although I fared relatively well against most of these, I never learned the theory and just don’t have the time! 90% of players respond to CK with the advanced variation, for which I am reasonably prepared, and I would normally meet h4 with h5 or h6 top avoid the bishop trap. Thanks for putting the game into playable format and “immortalizing” it for me! I’m a slow player so I almost never do well at blitz…. I never really came to a firm decision as to what to play against the C-K. Looking over my old games I see I started off aged 14-15 playing the Caveman Attack, then switched to the Exchange Variation the following year, and a year later again played 2. d3 and switched to a King’s Indian Attack type set up – but we’re talking not much more than a half dozen games in all. And in rapid games down at the club these days I usually seem to end up with the White side of the Panov-Botvinnik Attack against the C-K. So you could call that ‘confused’. I do OK at 10 min-a-side games, mostly, like in the club rapid play. But I’m utter rubbish now at 5 min blitz, which is what I primarily used to play in my teens. I shall plead “Ageing Neurones”. White should have played Qd4 that prevents a mate attack and covers f6 square. First, agreed Black should have played 1. Qd4! last move, covering f2 and threatening mate on g7. 1. …Rf7 2. Rxf7 Qxf7 is forced. when White can probably even take the a7 pawn with some advantage. 1. ..Qf6, as you spotted, is the move for Black in the diagram, forking the White rooks. The only defence is your 2. Re5, when I would have expected the sort of line you gave, 2. …Nxf2! 3.Qe3 Nxh3+ 4.gxh3 Qxf3 5. Qxf3 Rxf3 and you’d reckon Black should be winning the ending, though it would still take a bit of work. In fact, after 1. ..Qf6 my opponent played 2. Rxb7?? and the game continued 2. Rxb7 Qxa1+ 3. Kh2? (3. Qf1 is better, though it leaves White the exchange down) Nxf2 4. Qg6. So a follow-up Q: How can Black finish White off neatly after 4. Qg6? (Diagram 7, above)? PS NO CHEATING with Fritz!! Anyway,I am still at uni so I will try without a board (very difficult for a patzer…) and without any program. You picked the same move as I did in the game, Alexandros. The only ‘extra’ nuance is that White can interpolate a crafty Queen check on e6 after 1. ..Rxf3 – 2. Qe6+ Kh8 3. gxf3: But, although Black doesn’t win the Queen in that line, it’s OK because then 3 ..Qh1+ 4. Kg3 Qg1+ 5. Kf4 (or h4) Qg5 is actually mate!! 1. …Qh1+, as you say, is the alternative, and is more ‘forcing’, especially since 1…Qh1+ 2.Kg3 Rxf3+! 3.gxf3? Qg1+ wins the white Queen as before. This was the line the club’s star junior player (age 14 and a half, grading a terrifying 2000-ish FIDE) suggested. I did point out that you’d have to be convinced that if White plays 3. Kxf3 (rather than 3, gxf3?) then his King will get hunted down and mated after 3. ..Rf8+.. Of course, my young friend had probably calculated the mating line, which I’m sure is well beyond me.